I am not much of a decorator and steer clear of any kind of decoration. Two reasons. One I am terrible at it ( the pictures below will tell you). Two I have the patience of a 1-year-old. Oddly,during Christmas and I want to add those little touches to my cakes. I do not like fondant as I find it too sugary. Marzipan is on the sweeter side too, but tastes pretty good as well. 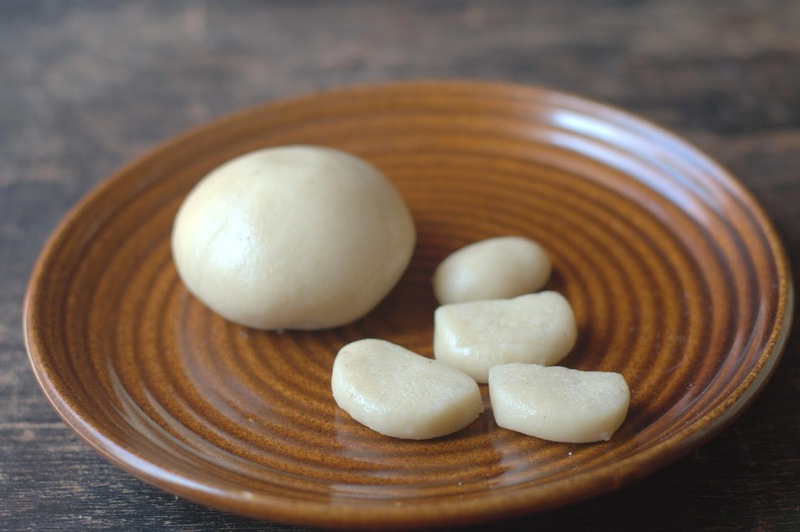 I do not have to buy a whole lot of fondant and waste it, I can make marzipan in 5 minutes. So it works well for me. 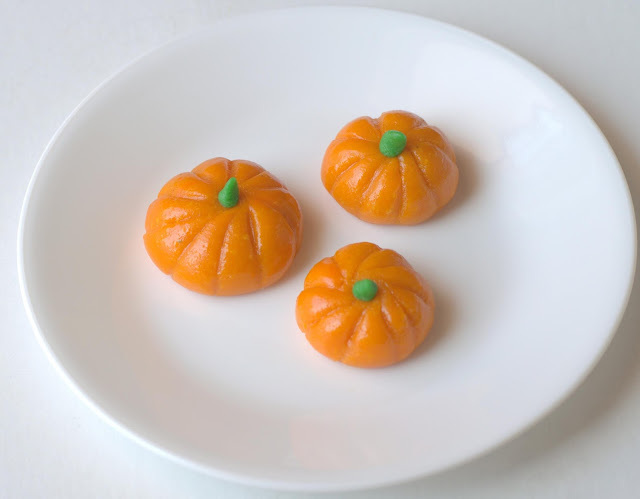 During Christmas season, it is good to have some nice play dough kind of marzipan to make those little carrots or pumpkins or stars for your cakes, it will instantly make them more attractive and festive. You will find different recipes using different methods for making marzipan. There are recipes with egg, with corn syrup and no-cook ones, varying proportions of sugar and nuts.There are recipes for marzipan meant for modelling which can be used in wedding cakes etc. In this recipe, there is no cooking, no tricky sugar syrups. Marzipan is made with almonds, cashew or even pistachios. Almonds need to be blanched, dried completely and then processed of course, but with cashews it is even more easier and faster. Here is a simple one inspired by one of Rose Beranbaum's recipes. This is fairly easy and worked well for me, but as always details make a difference. Please do read the recipe / watch the video carefully and follow the recipe correctly for the best results. Cashew nuts - 38 grams, crushed into small bits this is important. These need to be at room temperature. You don't want them hot or cold from the refrigerator. Water - 1/2 teaspoon pus 1/2 teaspoon if needed. Take the powdered sugar and cashew bits in the smallest jar of your mixer jar. Grind in short spurts on the lowest speed. It is most important to grind the nuts right for best results. For more details on grinding nuts, please watch my video below. Redistribute the mixture using a spoon. Grind again in short spurts. We need to grind until it is fine, but still powdery. Do not over process or it will become oily. Once you grind the nuts to a fine powder, sift once to remove any largish pieces of nuts, this will give you a smoother marzipan. If adding any flavoring, add it now. Add the liquid glucose and mix with your hands, it will give you a better feel of the consistency. Add a tiny tiny bit of water. Be extremely careful here, add 1/2 tsp at a time. Even just a little bit of extra water and you may end up with soup. You will need to add more sugar till you get the right consistency and your marzipan will become too sweet. At this stage,it will look a a bit crumbly, but it will come together. Knead lightly. Do not overwork or it will become oily. Pinch out smaller portions if you need marzipan of different colors. Wrap in clingfilm and store airtight. This should keep well in the fridge for a few days. You can also try freezing it. Bring it to room temperature before kneading it gently, that is really important. In the worst case, if your marzipan becomes oily or very sticky, you can add a tiny amount of cornflour and mix. It will not taste as good, but should work fine. Bring marzipan to room temperature and roll between two sheets of baking parchment, and cut into shapes or mold as needed. Please do try this and keep it ready, you will find it handy in the Christmas chaos. You can easily get liquid glucose at most baking supplies stores, buy the smallest box. You can also check online. Weighing / measuring liquid glucose is messy, so line your counter with plastic sheet, dip a hot spoon into the jar of liquid glucose and weigh.Weigh this as we as that is easier than measuring it. To measure, lightly oil the measuring spoon and level with a wet finger. If grinding nuts for the first time,please watch my video here.